The Boxing Truth®: Is Lucian Bute Back In The Mix? Is Lucian Bute Back In The Mix? Former IBF Super-Middleweight world champion Lucian Bute has certainly earned his distinction as one of the stars in the sport of Boxing. Bute, who won the IBF world championship in the Super-Middleweight division in October 2007 with an eleventh round stoppage of Alejandro Berrio ruled as a dominant champion for nearly five years, successfully defending his championship nine times. Along the way the Romanian born Bute was able to garner a significant following in his adopted home country of Canada. After nine successful defenses of his world title, Bute carried an undefeated record of 30-0, with 24 Knockouts into his fight with Carl Froch in May 2012. On that evening Froch’s power was simply too much for Bute as he was able to stop the previously unbeaten world champion in the fifth round. Prior to this defeat most would argue that the closest Bute had come to defeat was in his first fight against longtime contender Librado Andrade in October 2008. Bute outboxed Andrade and had the fight won on points before being caught by the challenger in the closing seconds of the fight. Andrade knocked Bute down with a barrage of punches. Bute however, was able to beat the count due in large part to Andrade being warned by the referee to get in a neutral corner. The referee halted his count of Bute while warning Andrade, allowing the champion more time to recover. The controversy notwithstanding, Bute was able to retain his title and silenced any doubts in his rematch with Andrade in November 2009 in scoring a fourth round knockout. Following the first loss of his career at the hands of Carl Froch, Bute moved up in weight to the 175lb. Light-Heavyweight division. After successfully winning the North American Boxing Federation (NABF) championship with a twelve round unanimous decision over Denis Grachev in November 2012, Bute faced former WBC Light-Heavyweight world champion Jean Pascal in January of last year. Although Bute would rally late in the fight against Pascal, he would come out on the losing end for only the second time in his career. Following that fight, this observer stated that it was my opinion not only based on his performance in his fight with Pascal, but also his performance against Denis Grachev that Bute did not have the same confidence that he once had. Whether or not his tentativeness to let his hands go against Pascal was attributed to any effects he may have suffered in his fight against Froch is a subject as I said following his fight with Pascal that could be debated. 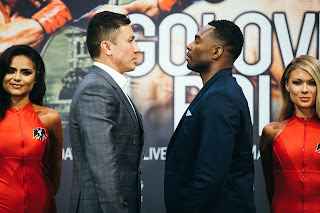 I also stated that although there may have been some who may have been of the opinion that whomever lost that fight may well have been finished on the top level sport that perhaps with time to reflect on his career Lucian Bute could find himself back in the discussion of top fighters in either the Light-Heavyweight or Super-Middleweight divisions. This observer also alluded to the possibility of Bute taking more of a gradual approach in his comeback rather than jumping right back in against top level opposition. The first step in Bute’s comeback following his loss Pascal came on August 15th at the Bell Centre in Montreal, Canada against current European Super-Middleweight champion Andrea Di Luisa. In some ways Di Luisa, who was moving up in weight for this fight turned out to be the perfect type of opponent for Bute, who was coming off of a nineteen month layoff. Di Luisa was able to provide some resistance in the first two rounds of this fight and showed that he intended to give Bute a test in his first fight back. Bute was provided with an opponent who much like himself has the ability to execute his offense in spurts and was more than willing to engage with him. Bute however, would bring an end to the fight in the fourth round dropping the “Game” Di Luisa with a left hand and causing Di Luisa’s corner to throw in the towel to save their fighter from further punishment following a follow- up barrage from Bute. Although there is not much one could say about this fight, it was still an impressive performance by a former world champion who was looking to get back in the win column. The question coming out of this fight is did this victory put Bute back in the mix? It is important to remember that the only two fights that Bute has lost as a professional came against two world-class fighters, both of whom were world champions. The question of whether or not Bute is back in the mix is one that will probably be answered when he gets an opportunity to face a fighter who is ranked in the top fifteen in one of the sport’s respective sanctioning organizations. The most important thing in this observer’s eyes will be whether or not Bute can remain active. If he can stay busy and more importantly if he continues to win it is logical to assume that Bute will be back in the discussion of top Light-Heavyweight contenders in the not too distant future. This victory over Di Luisa however, did serve a purpose in perhaps beginning the process of restoring the former world champion’s confidence. It will be interesting to see where Bute goes from here. Can Witherspoon Continue Winning Streak? What’s Next For Jacobs And Garcia?